Dear Brother Boniface, You have written many excellent and wise posts but this is perhaps your best piece ever; it is instructive, incisive, and it cuts right to the heart of the anthropocentric matter that is being shoved down our throats. Yes, but the pope does not like rosary crusades, especially if they are counted, remember? Right on. A great post Boniface. Your quotes from Pope Francis' homily are very telling about the spiritual state of his soul. I've heard several comments about whether God is punishing the Church and not just in reference to Francis. For the first time I'm asking myself if it could be true and not just as a theoretical possibility. I've always understood JP11 and BXV1 as intellectual geniuses with profound spiritual lives. Yet there are unanswered questions about the appointment of so many mediocre or corrupt bishops. Can that be completely explained by liberal bureaucratic machinations completely beyond the pope's control. And if true, is God punishing JP11, personally a holy man? I remember many years ago reading the late Fr Richard j Neuhaus in First Things, before it went on line, puzzling over why good men were not appointed to head up dioceses. Neuhaus had no answer. I really have no idea what unfortunate conditions would have to be present for God to chastise His own Church in this way. Perhaps Boniface you could write a post on this very subject if you haven't already. I know that as a pre Vat 11 catholic my education in the Faith was sturdy but lacking sophistication. One thing I've had to come to terms with re Francis was my implicit assumption the " the centre has to hold" else the edifice would collapse. Which of course is absolutely true as long as I realize that Christ is the true centre no matter what terrible crises overtake the Church. M. Prodigal, yeah, he doesn't like "rabbits" either, but that's his problem, not mine. Dear Boniface, Where does one find accurate information on Pope CelestineV and Pope Boniface VIII and that time period in Church history. “This does not resolve anything,” Pope Francis has said with regard to the idea of giving communion to the divorced and remarried. Much less if they “want” it, demand it. Because communion “is not a badge, a decoration. 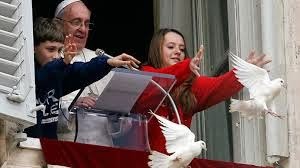 No.” In his latest big interview Pope Francis threw cold water on the expectations for substantial change in the doctrine and practice of Catholic marriage, which he himself had indirectly fostered: “Overblown expectations,” he called them. Pope Francis pandering to popularity and his use of spiritual welfare--unearned, cheap grace-- to draw more folks into the fold is a short run strategy at best. In the long run the elimination of conditions for repentance will result, as it has, in no need for confession and ultimately in no need for the Church at all. Pope Francis is now saying, it seems, that there is no hell--no punishment for sins after death. Sinful souls will merely be exterminated. It is going to be very difficult for Bishops and priests and the laity to resist such a generous welfare program What we have here is Franciscare. You will have to wait till the afterlife to learn what it really means. That is just a tactic. You are presuming a consistency in the man that does not exist. I remember in my home state, several years back, our governor stated that he had no intention of pushing through a particular piece of controversial legislation. But then all his people in the Legislature came and pushed it through to his desk, such that it appeared to be the will of the Legislature, and he signed it. He was able to sign it while suggesting that the impetus for it did not come from him. Francis will say he does not want to change anything, but he is creating momentum towards it with his pronouncements. You are right that the people as such are not demanding it, but a certain cadre of bishops will demand it. Then Francis will play the role of the humble pontiff merely assenting to the wishes of his bishops. Boniface, yes, all politics, bad politics. Give them what they want not what they need. Then when the whole thing continues to go down hill blame it on them. For the folks in the pews it's lose lose. Say it ain't so Francis! I have just visited your blog for the first time and read your very erudite comments on mercy.It seems to me you are just the man I have been looking for to ask a question bugging me. Why are so few true, traditional Catholics sedevacantists? I have always tried to be a devout Catholic. I was educated in the Faith by holy, Irish Catholic Nuns, Brothers and Priests before Vatican II. I am keeping it very short. Why can't Trads perceive the heresies of the conciliar popes? Why can they not understand that, in terms of the teachings of Robert Bellarmine and others that heretics can't be Popes formaliter. Why can't SSPX realise that their position is schismatic? Why can't they see that the novus ordo church is the ape of the Catholic Church foretold by Our Lady and others? Why can't they see that sedevacantism is the only safe position a true Catholic can take which is consistent with the Faith of 2000 years? Why is it so obvious to me? Am I missing something? Why do you not have a link to Novus Ordo Watch where sedevacantism is discussed and presented in depth? Have you ever written on sedevacantism? The Church is indefectible, the Faith is absolute, not relative. There is no place for novelty. There are only Catholics - no such thing as liberal Catholics, conservative Catholics etc., etc. The Church is ONE. Why are all Traditionalists not sedevacantists? Because I am not a Sedevacantist. Because Sedevacantism is itself a heresy that divides the office of the papacy from the person of Peter, and denies the never-failing faith of the Roman pontiff; because it attributes absolute importance and authority to the opinions of theologians; because it is a heresy built of despair which has lost the virtue of Hope; because there is not a one-to-one correlation between a mere heretical statement and "losing the faith" in a theological sense; because Sedevacantism leads to an overthrow of the Church and its divine constitution and leads souls out of the Church. Yes, my friend, there is quite a bit you are missing. We do not tolerate promotion of Sedevacantism on this blog. Being a sede is not the answer. You cannot call yourself a traditionalist if you are not in communion with Rome because it is that particular communion that makes us Catholic. Actually, the heart of tradition is loyalty to the Holy Father and that is why I will never step into a SSPX chapel. So if you are a sede or you are thinking about becoming a sede, DO NOT DO IT. Do not lose your soul in the midst of the chaos. Stay loyal to the Holy Father, attend the TLM if you can (FSSP, ICKSP, Diocesan, Norbertines, whoever else is in communion with Rome), work, and save your soul. Boniface, I have a quick question for you. Is it wrong for Catholics to hold a Theistic Evolution stance? I shared some links and the location thereof concerning the compatability of evolution and Aristoliean metaphysics some time back. Did you ever get around to reading them Boniface? I made clear that I was not entirely sure what to make of them, so I was hoping you did. Anyway, great analysis as always. I didn't notice that this "year of" thing jinxed whatever it was intended to honor. I did read them, but it has been awhile and I have quite forgotten the content of them. If it wouldn't be too much trouble, could you send them again, but this time send them to the email uscatholicam [at] gmail.com? That way I can put them on my every growing "to do" list to review and write on. Very well done with insight I have not previously heard. Yes, the battle is God's and for our part, we must remain steadfast and trusting and continue in doing His Will in our individual lives. I have to remind myself of that...this is my first visit to your blog. I'll be back...thank you!